I wanted to mention a few things..as I have been away from the computer for awhile. Check out http://www.jazzstandards.com/. This link will point to the list of songs that are considered jazz standards. (about 700). You can read the entry which provides the criteria for the selections. I very much liked the Amazon widget which has short sound files of the different versions, Very handy for a musicians and a real kick to listen to the various approaches. One of the definitions from the site: A “jazz standard” is a composition that is held in continuing esteem and is commonly used as the basis of jazz arrangements and improvisations. Note from Founder: Jeremy Wilson JazzStandards.com was developed by Jeremy Wilson, a jazz fan and information management specialist. When looking for documentation on jazz standards a few years ago he found it was available, but spread out and direly in need of centralization and preservation. Using newspaper archives, liner notes, websites and books, many of which are out of print, he has documented the origins of the top 100 jazz standards. And more are on the way. All in all, I highly recommend this site. Hopefully, you will find it as interesting as I did. After a long haul and an epic battle with procrastination (I won) I have finally had my main site updated. I’ve even included a chat box (meebo) that connects to many other chat applications. Feel free to pay the site a visit and if you have some recommendations please send them my way. I now have a “Listening Room” on the site where you can stream my last 2 musical projects. After much consideration/soul searching I have decided to record another session at St. Clement’s Church. I enjoy so many tunes that it’s sometimes very difficult to choose which one to record. It’s a bit different with my originals, I prefer to listen to them once recorded as this lets me analyze them (over and over, LOL) and from that….I make the changes that fit with my concept. It’s not a speedy process, and it does get a bit messy but I have to claim it as my own. I had a good time at various jam sesions during the Montreal Jazz Festival. It was great to run into musicans I have not seen in some 20 odd years. Our playing has matured and it’s wonderful to hear that. I had the pleasure of catching Bill Charlap and Branford Marsolas..both excellent shows. I was able to honor the memory of Len Dobbin at his memorial tribute show at L’astral on August 9. Dave Turner, Jim Hillman, Adam Over and I played a tune that was dedicated to Len by Pepper Adams. The tune is called “Dobbin” and it’s a classic minor bebop. The turnout was great and we were happy to honour him in this way. Going up North this Sunday? I also perform at Mont-Tremblant Jazz Festival with FRANÇOIS RICHARD & the NOUVEL ORCHESTRA, at 19h30 – He is a flautist who is adventerous. If you in the region, stop by. Our show is $25 but there are also some free shows in and about town. I am getting ready to record some new material at my upcoming concert. (Sat, Aug 22 – 8 pm : 4322 Wellington Street) If the acoustics in the church work..we will release a new CD. The theme for the concert series is “She Walks In Beauty” which is based on a Lord Byron poem. Roland Graham wrote the melody and each ensemble (there are 8 of them) will interpet the music. I had fun re-harmonizing the melody. It’s very nice. All the shows are Free, but donations are acepted and given to the musicans. Roland has done a great job in promoting music here in Verdun. 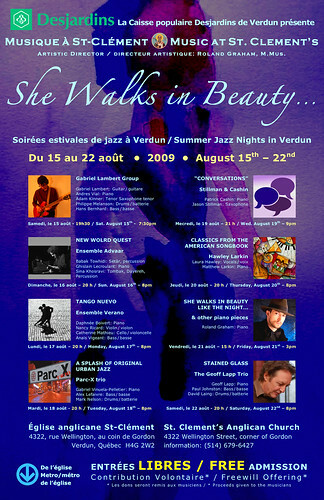 Summer Jazz Nights In Verdun, originally uploaded by Geoff Lapp Trio. I’ll be performing on night of Aug 22 at St. Clements Anglican Church. Stained Glass is available for purchase at Itunes, cdbaby Amazon.com. or call 1-800-BUY-MY-CD. For the best deal: click on this link for the reduced purchase price of $7.25. Geoff Lapp Trio posted a photo: Thanks Tim for a great job done on the poster.